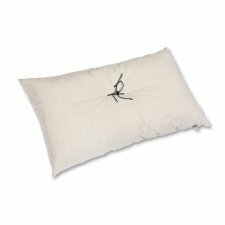 Anti-choking pillow in latex, with cover of natural non treated cotton. 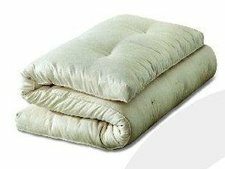 Nature pillows with the trade mark Moeco are comfortable, transpiring and improve your rest. Size: 48x25 cm. and height 4 cm. 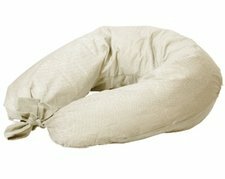 Breastfeeding pillow in the shape of a horseshoe with removable pillowcase in untreated raw cotton (with ties to close). 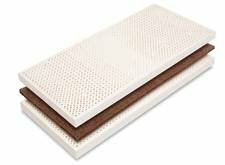 Available padded with natural latex flakes (is lighter and handier than the padding in spelt husks). 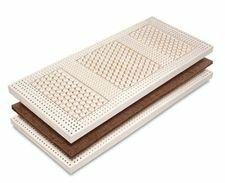 Thermo insulated and hypoallergenic futon for cot, the futon assure a continue perspiration and defends us by the benning of magnetic fields, dust and acharus. Quilted by hand, each futon has a zipper inspection. Model in pure raw cotton not treated with padding of carded cotton layers. 2 sizes available: 60x120 cm. Height about 9 cm. Babies pillow, suitable for cot. 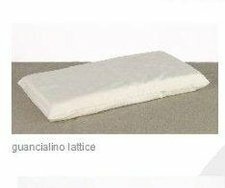 Nature pillows with the trade mark Moeco are comfortable, transpiring and improve your rest. Made from pure raw untreated cotton, zip fastened, removable cover. Filling in pure untreated cotton.